This beautiful flip-book (where two stories starts at either end and meet in the middle) is a triumph of beautiful design and illustration, carried aloft with a whimsical story about leaving the comfort of home and forging out into the world to meet the new and exotic. It's also, in some ways, about both friendship and rebirth. 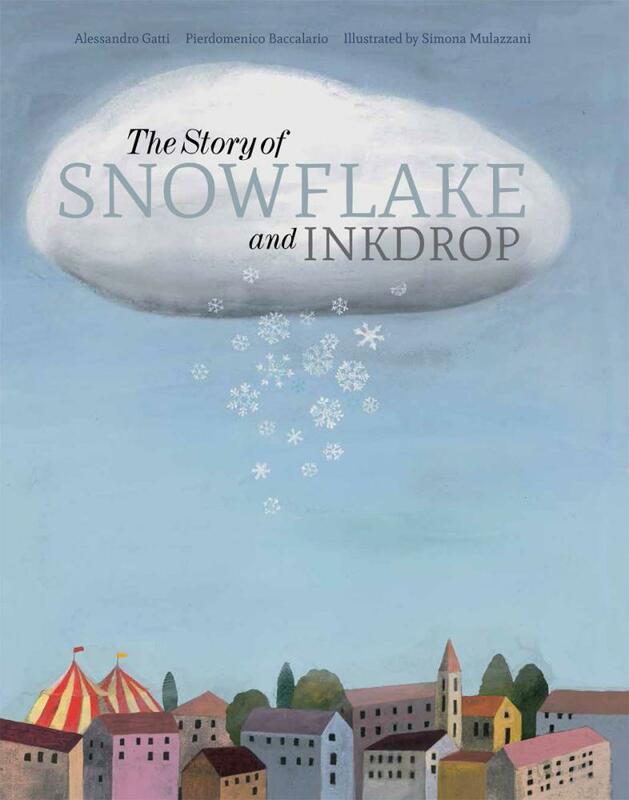 We first meet Snowflake (or if you pick up the book the other way, you'll first meet Inkdrop), who has been fluttering down from the clouds for a very, very long time. Snowdrop wonders where it will land--and is mostly uncertain. It floats from place to place, from playground to circus and finally finds itself sailing towards its fate--a black inkdrop soaring down the street. The two blend and their fates collide. 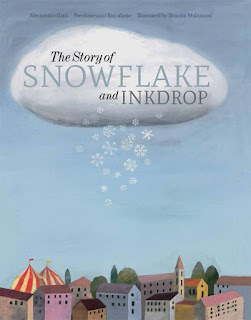 From Inkdrop's end, a similar journey occurs as a gust of wind upends its bottle by the window, and as it soars outside along the street, it meets with the most beautiful snowy creation, fluttering along. As both collide--in a sort of deathlike/birthlike melange, both are happier than they have ever been before. Peppered with beautiful paper-cut pages (white for Snowflake, black for Inkdrop) that peek through to the pages beyond, this is a book of high production value. The central page where the two elements meet is a full double page page flip-out, with striking cut-outs and the a full illustration showcasing the beauty of blending black and white until it somehow forms colour. This is a book that will touch hearts, and make children both think and feel on very deep levels. Subtle, highly creative and visually beautiful.